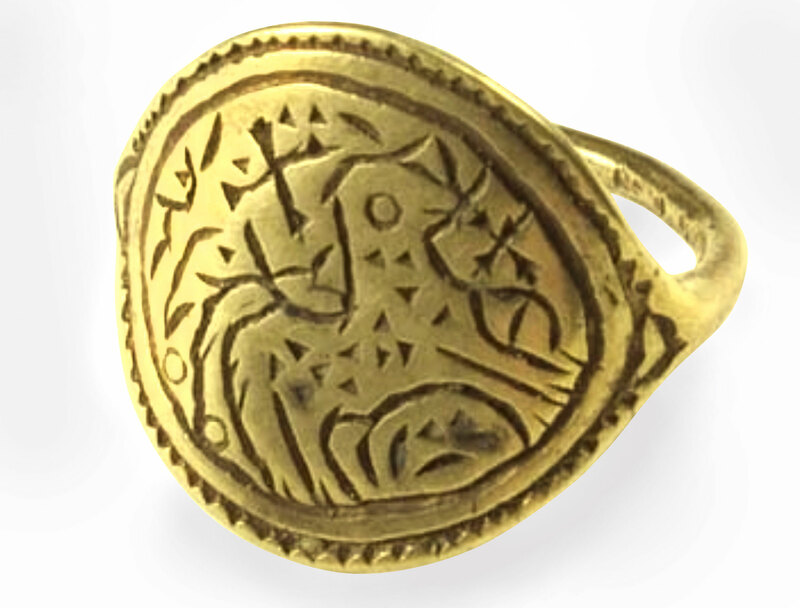 Early Christian golden rings in Friesland and their possible significance on the process of Christianity. A hypothesis. Over the past 15 years, a remarkable number of golden rings from the early days of Christianity (8th-9th century) have been found in the north of Fryslân. The number of golden rings found is currently at least 8. 7 is known to have been found in Fryslân and 1 probably. 4 of the rings are found on mounds in Westergo, 2 in presumably raised earth mound in Oostergo, 1 ring is dredged from the Ee (collection Admiraliteitshuis in Dokkum), and the other one (collection Haedecke, Dld.) has found in Holland as a site and the form and date is acceptable to Fryslân. A golden ring from the collection of the Admiraliteitshuis in Dokkum was recently added to this list. The ring is in the permanent exhibition about Boniface in the Admiraliteitshuis in Dokkum! Although so far referred to as "pagan ring", there are strong indications, after research by the writer, that the ring is early Christian! It seems that one of the apostles, Mattheus, is depicted on the ring, with a bird on both sides, but more about that later. Maybe more specimens have been found that are not yet known. Time for an inventory and possible explanation for the presence of this yet spectacular find group. All these rings have mutual similarities with each other in several respects as shown in a separate appendix. The rings 1, 2 and 3 have a number of characteristics that show striking similarities. In particular, the stylized "signs" are striking. 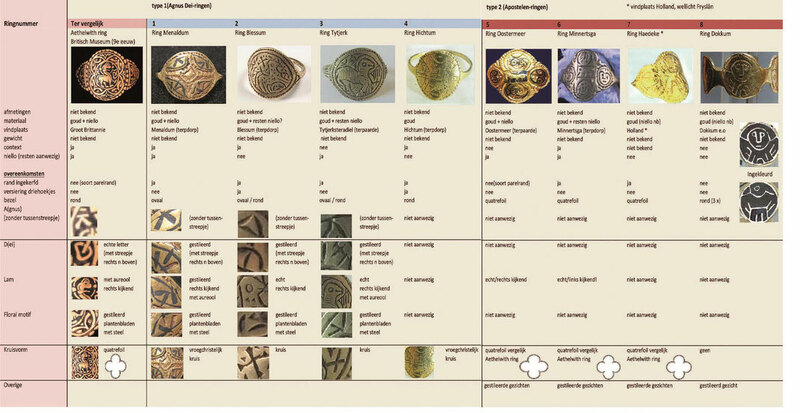 A number of these signs can be found in the Aethelswith ring from the British Museum (as a comparison in table) with which a link with the Anglo-Saxons seems to be made easy. The rings 5, 6 and 7 again show great similarities and all three have the quatrofoil shape, which also occurs on the Aethelswith ring. Moreover, all these rings have niello or were probably inlaid with it. Niello is a black to blue mixture of copper, silver, sulfur and sometimes lead. Engraved lines are thus filled up and form a drawing on a golden or silver background. Only rings 4 and 8 seem slightly different (no niello or any other drawing) but still have similarities with the other rings in terms of shape and symbolism. 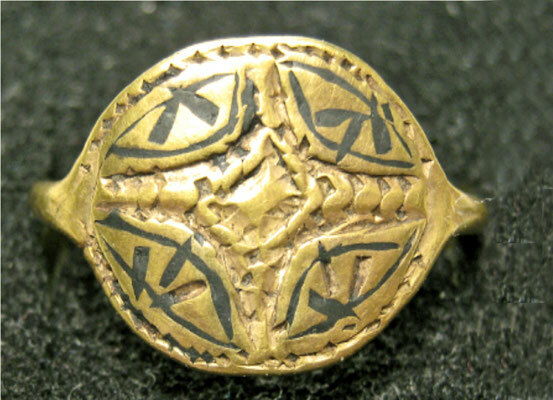 Ring 4, for example, has a carved cross and looks similar to ring 1 in model 1, ring 8 has a picture of 1 of the 4 apostles where ring 6 and 7 have pictures of all 4 apostles, it said very stylized. What is striking is that all rings are gold and fairly simple in terms of execution. 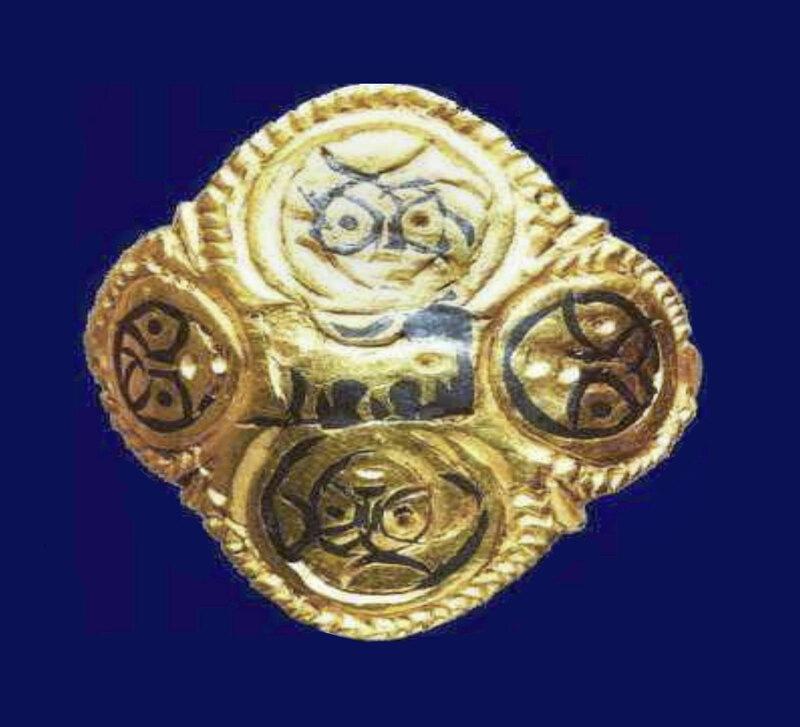 Although the rings with niello inlays suggest that they are of Anglo-Saxon origin (rings with niello was a specialty of Anglo-Saxon goldsmiths), there is an important characteristic which contradicts this. 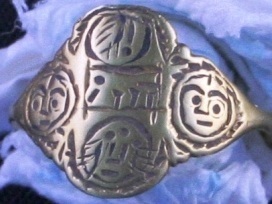 The "sloppy" way in which the rings are engraved and used with niello is not Anglo-Saxon. What we know about these goldsmiths is generally beautifully finished (see Aethelswith's ring). Apparently a lot of time and love was put into the manufacturing process. 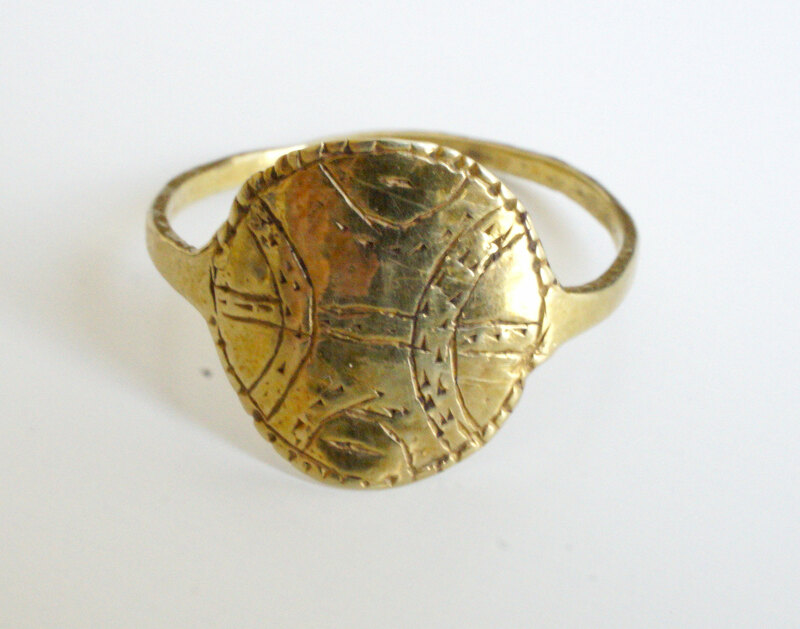 Do we have to conclude that the Anglo-Saxons did not manufacture these rings, but that the rings were made here in Fryslân by local goldsmiths? I do not think so. There are no indications that local Frisian goldsmiths were active who manufactured products containing niello. From this period outside these rings, namely no other products from Fryslân are known in which gold and niello is processed. There may be a reason that these rings are made "primitive". Of course this is hypothetical but for the still spectacular large group of early Christian rings from this time, this theory seems worth investigating. There were few goldsmiths who had the specialism of making gold jewelry with niello. 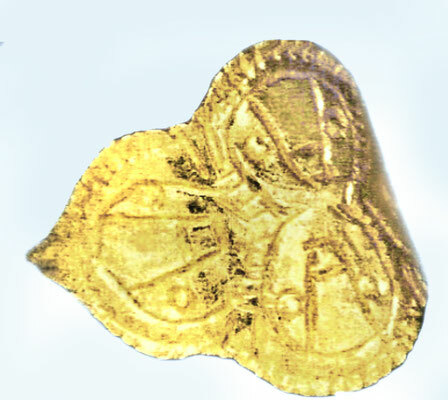 In the period around 800 gold was very expensive. In Fryslân there are significantly fewer gold finds from this period than from the period around 600. It is known that there is probably a Frisian Royal family seated in the areas around Wijnaldum. With this, the presence of a goldsmith can also be explained. If this royal family had been around 800, it was plausible that there were also "rich" gold finds from that period. However, this is not the case with which the presence of a royal family or other high nobility can actually be ruled out. Has the absence of a goldsmith been declared? Probably. Why then the presence of a considerable number of gold rings from that period? And also with some of the same characteristics? And why are these rings only found in the Frisian terpen area? And is it a coincidence that all the rings found are gold and not silver for example? Many questions and so far few answers. The rings are all from the early days of Christianity in Fryslân. A turbulent time in Fryslân because the residents at that time were very stuck to their pagan customs. The mostly Anglo-Saxon missionaries and their followers had to deal with a lot of resistance. The most famous example of this is of course the murder of Boniface, at Dokkum. It therefore took centuries before the pagan Frisians were converted. After the conquest of Fryslân by the Franks, the road was really cleared for the conversion work. The mostly Anglo-Saxon missionaries traveled from mound to mound to spread their message. 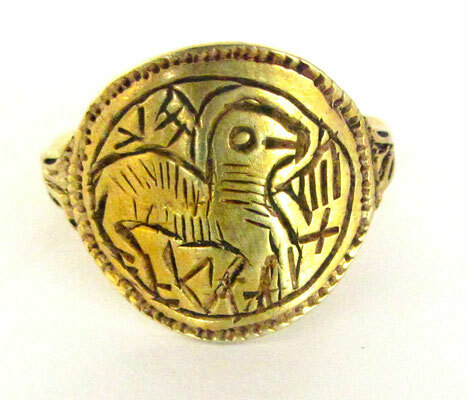 Were gold rings with Christian symbolism perhaps used as a means to bind the hard to persuade Frisians? Because gold was very expensive at that time, local leaders were possibly "bribed". The rings can be made on the spot by an (Anglo-Saxon) goldsmith who traveled with the missionaries. The goldsmith had to work quickly and primitively, after all, he did not have his own studio at his disposal and could not be busy with 1 ring for weeks. The explanation for the primitive execution but with Anglo-Saxon characteristics. Perhaps there were several goldsmiths. This could explain that the rings also have different characteristics. Ring 8, the ring from the Admiraliteitshuis, does not look like the other rings. Although it is quite certain that this ring dates from the same period, there are a few things that stand out in terms of shape and finish. The other rings are fairly simple in execution, rather sloppy than refined. I have doubts about the ring from Dokkum. The composition of this ring shows a rather high level of craftsmanship. It seems that this ring is not made in a short period of time. It could be that this ring was worn by someone who brought faith in Fryslân, so a missionary? Boniface perhaps? In any case, it is clear that the ring comes from the early days of Christianity in Fryslân, but it is very doubtful whether it was produced by a traveling goldsmith, but it is not excluded. The ring probably shows the apostle Matthew, who in ancient times is often portrayed as a person with wings, with a nimbus above his head. In the image, which is also shown as negative, you can clearly see that the face is shown with wings and a nimbus above the head. Signs that we are dealing with the apostle Matthew. The birds shown on the other two planes can indicate, for example, pigeons, but also ravens or peacocks are seen as early Christian symbols. 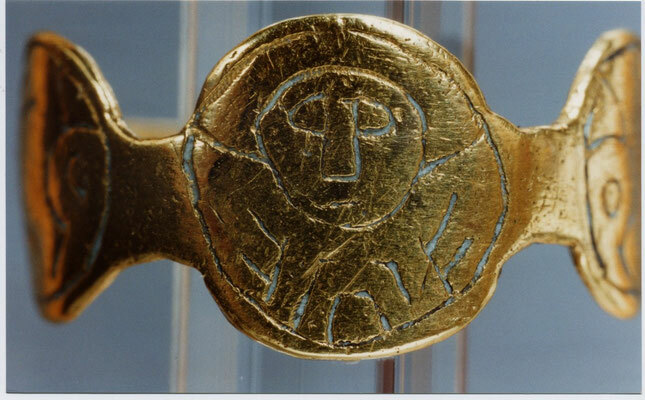 Golden rings as a weapon in the battle to get Christianity into the stiff Frisians. Because the candling process was difficult. An ultimate attempt to let Christianity get firm ground under the feet of today's Fryslân. A hypothesis, of course, but perhaps an interesting one. Further research is therefore in order, because perhaps these rings played a major role in the Christianization of Fryslân. Moreover, a number of questions have not yet been resolved. Especially the question why these rings only occur in the Frisian terpen area is a very interesting one. There must, in my view, be a reason for this fact! Hopefully this find group will receive the attention it deserves through this article and a number of questions will be answered by further research!